Oaks Christian Online School sophomore organizes community service project arranging games and scrimmages with the California Condors Special Needs Hockey team. “Since there are no other special needs hockey teams in California, I got some of my teammates to come and play hockey with them, hang out and have a small party after the ice time,” said Vincent. 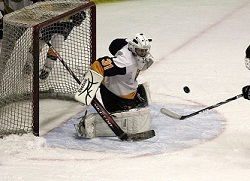 Vincent Sepe is a stand-out hockey goalie and student athlete with Oaks Christian Online School(OCO). He is a member of the elite Channel Islands Rip Tide team who recently completed a community service project by arranging games and scrimmages with the California Condors special needs hockey team. The California Condors’ home rink is the Valley Ice Center in Panorama City. Players are between the ages of 14-24 and have a varying range of disabilities. The Condors compete in games and tournaments nationwide and in Canada, but they often do not have enough local teams to practice against. At a recent school forum, Vincent shared with his online classmates that many of these Condors’ players don’t get enough exercise, they often can move better on the ice, but they don’t get enough playing time, and there are some players who will actually play sled hockey because of mobility issues. Vincent also reported that the players were competitive but always really happy and seemed to have a lot of fun on the ice. Along with the on-ice practices and cupcakes afterwards, Vincent was also invited to accompany the Condors on the ice during the intermission of a recent Kings / Phoenix game at the Staples Center in Los Angeles, CA, where the team was awarded a $5,000 donation towards travel costs to an upcoming tournament in Texas. Vincent is currently a Midget 16 AA hockey goalie with the Channel Islands Rip Tide team and plays at the Channel Islands Ice Center in Oxnard, CA. This is his third season of playing travel hockey, and he went to the California state tournament his first year playing goalie. He came by the sport naturally through his uncle and cousins. Vincent plays year round on travel teams and recreation leagues and would love to play Juniors and then play in college. Vincent goes to school online with OCOS because of the flexibility it provides his schedule. “I’d like to go as far as I can with hockey”, said Vincent. For additional information about Oaks Christian Online School, its courses, curriculum, admissions or application process, please visit http://online.oakschristian.org, call 855.462.6257, or contact a school representative at online@oakschristian.org.